Sixty-seven people were detained as Greek police clashed with anti-fascist protesters in Athens during a rally, which was triggered by the Sept. 18 murder of an anti-racist rapper at the hands of a self-proclaimed neo-Nazi. 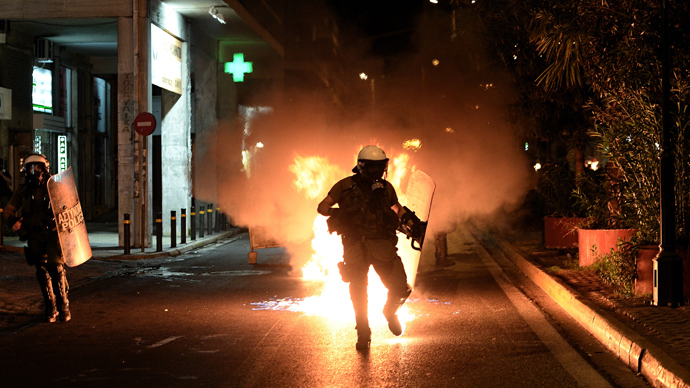 Tear gas and stun grenades were used by Greek riot police to disperse about three dozen men who threw Petrol bombs at the security officers in front of the Golden Dawn Party headquarters by thousands of anti-fascist activists. Some protesters also vandalized shops as police lines prevented them from reaching the headquarters. Around 10,000 left-wing supporters called for the demonstration on Wednesday after 34-year-old musician Pavlos Fyssas was stabbed to death on September 18 by unemployed driver George Roupakias, a Golden Dawn member. Roupakias said he was acting in self-defence when he killed Fyssas. “Pavlos is alive, crush the Nazis,” the protesters chanted as they marched towards the Golden Dawn office. In other cities including Thessaloniki similar rallies also took place. 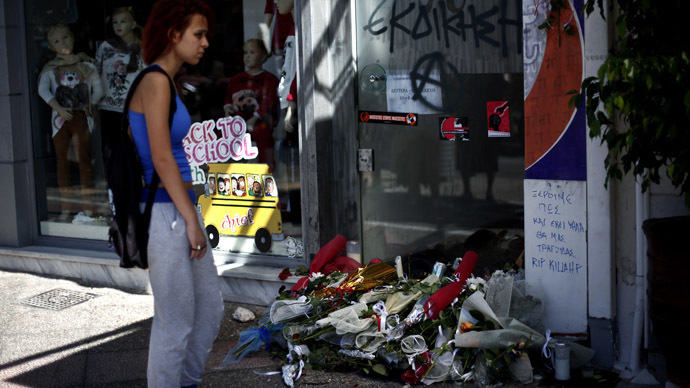 The killing of the musician has sparked a wave of protests that resulted in a crackdown by authorities on Golden Dawn members. The party has denied any role in the killing. The raids on Golden Dawn offices followed after reports emerged that the organization was hiding weapons, and that the party was conducting military-style training activities. 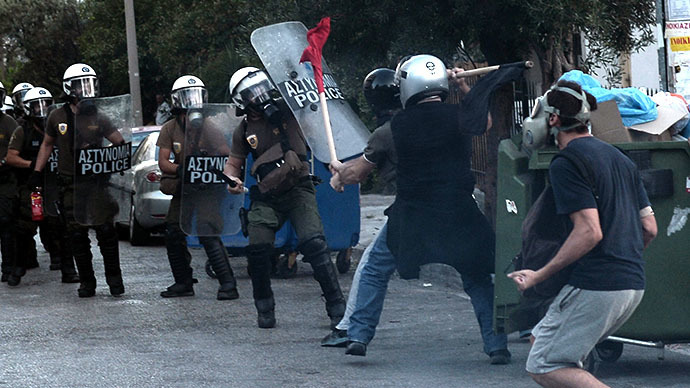 Golden Dawn activists have made headlines for frequently attacking immigrants. 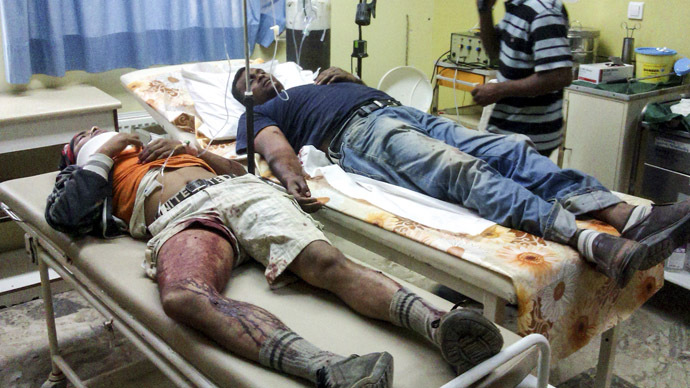 Earlier this month, they were accused of injuring nine people during an attack on Communist party members. Allegations of police collaboration with the party have also been raised after failure to investigate their alleged activities nationwide. Two police generals and several other policemen on the island of Evia resigned from their posts on Monday, suspended after failing to probe a Golden Dawn office that allegedly stored weapons illegally. Golden Dawn and their leadership have openly shared their admiration for Adolf Hitler, although they deny being neo-Nazi. In Greece’s 2012 general elections the party received almost 7 per cent of the vote and secured 18 seats in Parliament. Despite that electoral success, a poll conducted by the Alco company, published Wednesday, said that support for Golden Dawn has decreased to 6.8 percent after the musician’s killing, compared to 10.8 percent in June’s survey. The question that remains is how Golden Dawn managed to propel itself to becoming Greece’s third largest party. Giorgios Vathis, who claims to be one of the group’s oldest members, however, claims the exact opposite when asked about the ideological side of things. “It’s the only party that helps pensioners, poor people, and desperate Greeks who are suffering in this crisis. We’re not extremists and we aren’t against anyone,” he says. After re-iterating the party’s stance that immigrant shop-keepers should not be allowed to syphon money out of impoverished Greeks, he quickly tried to dispel any notion that Golden Dawn has anything to do with Nazism, saying the right-hand salute is purely incidental. 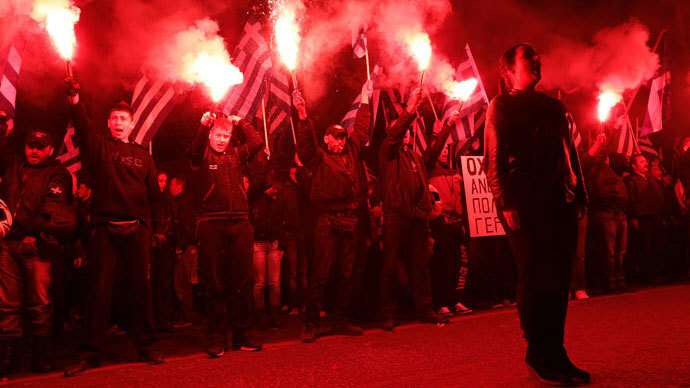 Golden Dawn is viewed as the country’s fastest growing political party. And the ideological rift between the ultra-left and ultra-right, which is evident in contradictory street graffiti messages, is unlikely to get better, because the real problem does not appear to stem from ideology, but economics, Kafanov believes.